When is Street Sharks getting starter lights and bleachers? Exercise outfits seem to fall into two camps: garments for those who want to blend in, and those--usually in iridescent colors and futuristic materials--for people who seem to want to say, "Check me out, I’m exercising!" A new, LED-infused cycling and running jacket most definitely falls into the latter camp, albeit more for safety’s sake than for fashion’s. A band of strobing lights streaks up the back, across the chest and out the arms of the Badger 360° LED Jacket, providing visibility from any direction, from up to a quarter mile away, to warn approaching cars. Creator Quanns Leung of Los Angeles-based athletic gear company Badger Gears says that he and his business partner’s late-night and early morning triathlon training sessions motivated the jacket’s design. "We didn’t really feel safe running or cycling at night," a sentiment that’s supported by stats: The majority of bike accidents occur between 4 and 8 p.m., when dusk collides with rush hour. Quanns acknowledges that Badger Gears’ jacket isn’t the first to incorporate LED lights, but he says that his product’s lights won’t shine in its wearers eyes. Plus, the lithium ion battery pack only weighs one ounce, recharges with any USB port, has an integrated controller to cycle through seven different lighting settings, and can last for 8 hours. The whole jacket weighs in at 15 ounces and folds up into a tidy pouch. Quanns says the jacket shouldn’t replace bike lights, but serves as an additional safety feature (or perhaps the only one, other than a flashlight, if you’re running and walking). Badger Gears is currently running a Kickstarter campaign to raise enough capital to help fund the first production run of the jacket. On a rare snowy December at UBC, the morning bus commute is a miserable crawl through a city shocked by a sudden burst of winter. Yet Jinhua Zhao, assistant professor at the School of Community and Regional Planning and the department of civil engineering, is beaming. He loves this weather as a metaphor for the shock he says Vancouver needs in order to establish a bicycle culture. In 2007, Vancity ran an experiment that invited people to share a fleet of 45 free machines. Two months later, half the bikes had disappeared and the rest were eventually donated to a nonprofit connecting low-income earners with transportation options. That short-lived pilot was inspired by UBC, which has been home to its own public bike share since 1998: $15 grants access to some 100 purple-and-yellow bicycles scattered around campus. Zhao likes these programs but wants more, much more. "What if we buy one million bicycles-cheap bicycles from China for, say, $30 million-and just scatter them around the city?" he says. "You need to build up enough momentum to say this is serious. One million bicycles would really disrupt the system. I would call it Magic Bicycle Week." Sure, many bikes would end up stolen, abandoned, or sold for scrap. But Zhao insists a sudden invasion would create a seismic shift in a city whose two-wheeled renaissance lags despite the best intentions of city officials and transportation authorities. This gladiator straight turns heads. With it’s fat front tire, chromed out alloy rears, and dropped frame, Atticus seems to float over the ground. Atticus is perfect for scaring roller bladers off the bike path, creating conversation at tailgaiting parties before the big game, or being the center of attention at the car show. Take it across those long flat surfaces for a late lunch and park it outside of the cafe to turn heads. Or better yet, valet this sonovagun for instant celebrity. All Urbantrike trikes are single speed, front wheel driven with a free wheel hub. Hand brakes control your speed and pantented sliding seat channel provides that perfect, custom fit every time. Rollin’ on twelves – 12″ alloy rims with 2″ of low profile rubber. Rides and looks sick. Fatty in the front – 20×2.5 street tread front wheel. Grip the road like a boss. Bucket ‘o’ comfort – Molded high density bucket seat. Low. Deep. Comfy. Dropped frame – Hovers 2″ above the ground. Like Luke’s Landspeeder, only Luke doesn’t own it. You do. Gorillas in the mist - 16″ ape hangers with black leather grips. Steer with ease and comfort. You may already know Hal&Al's always carry a regular selection of Abita products. 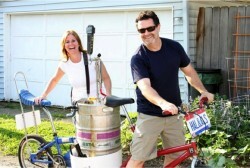 This picture was taken during a keg delivery run last summer and was submitted to the Abita French Quarter Fest Getaway Contest . We made it to the top ten as a finalist! So now we need your help. Please go to https://www.facebook.com/abita/app_451684954848385 and vote for the photo to the right (not the naked girl in the bath tub) Please note voting is through facebook and will not work on your mobile device. Voting ends March 10th. If we win, Hal&Al's will have a BIG party at the bar for all their facebook fans and friends. Thanks! What does a bicycle plus a motorcycle equal? A PiCycle of course. This nifty mode of transport is a hybrid bike that is powered by both human energy and an electric motor. Depending on your mood and how much energy you’d like to expend, PiCycles let you decide how you’d like to ride: as a bike, a motorcycle or both. But unlike your standard motorcycle, the PiCyle does not emit any tailpipe emissions and uses less than 200 pounds of CO2 - the same amount of energy as a hair dryer. Created by PiMobility, the eco-conscious company locally designs and manufactures these sustainable two wheeled wonders with the 21st century rider in mind. To see recaps and results from last years Gravel Rouser, scroll through the "Notes" tab on our main Facebook page. Please read this year's event information closely because there are quite a few changes. 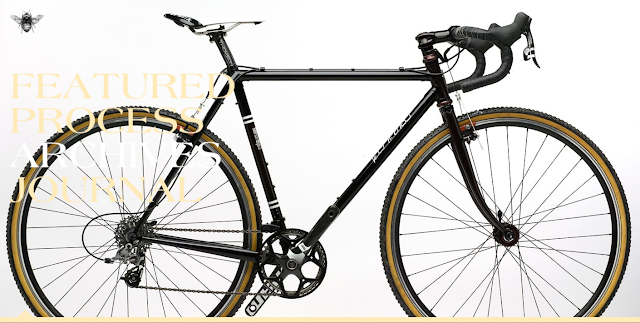 We look forward to seeing you in March for the best Gravel Rouser yet. I hope that you are well! I wanted to share my story with you as I have become an advocate for proton treatment for prostate cancer. The TV commercial is running in the Philadelphia market through March. I prefer watching the commercial with someone playing me rather than watching myself in the interview piece. Hopefully it will all help someone to get life-saving treatment that will help them to avoid serious complications. Detroit Bike City returns to Cobo Center to fill an even bigger space, Wayne Hall. With 100,000 ft2 of floor space and 30 foot ceilings, Wayne Hall is going to be filled with bikes, lots and lots of bikes. With vendors from all over the Midwest and beyond offering new, used, custom, road, mountain, BMX and more, all things two wheeled will be covered. Everyone in welcome to swap for FREE, details below. Detroit Bike City is the premier bicycle event of the year. Started in 2012, Detroit Bike City took hold of the cycling community with a bike show on a scale that Detroit had not yet seen, and it was met with great appreciation. Detroit Bike City 2013 is expected to more than double the first year in almost every way. Which means more for everyone! Attendees will have the opportunity to learn about new products, get a deal on last years and be a part of the growing Detroit cycling community. Individuals wishing to sell or swap complete bicycles, frame sets, wheels, etc. may do so in the Swap Section for no additional charge, limited to 2 bikes and 10 items per person. Additional bikes for $5 per, bike tags will be available at the door the day of the event, March 16th, 2013. CUSTOM BUILDER’S ROW A collection of the great talent that the Midwest holds. DETROIT MARKETPLACE Showcasing Detroit small businesses that doesn’t require them to be bike-centric but represents the City and our growth. BIGGER BMX DEMO With more space and ceiling height, the ramp show will be expanded and there will be a bike swing, which is pretty much the coolest thing ever, and interactive. BIKE AUCTIONS Multiple auctions throughout the day, a fun way to engage the crowd and introduce new ways to get a bike and contribute to different causes. CHARITY EVENT A black tie ballroom event overlooking the Detroit River. Ticket holders will get to preview the show, mingle with sponsors, vendors and reps, eat, drink and be charitable.MUSIC Adding a little more flavor to the bike show, there will be local bands and Dj’s gracing the stage. KIDS SELECTION With such a great response from families across the region, we will expand the safety classes, lessons, courses and have an area of youth bikes to buy/sell/trade. Who Should Attend:• Vendors and sponsors of all kinds will have a captive audience of people who all share in the love of bikes, and the best part of that: everyone rides a bike, we even have a saying for it. • Racers, commuters, leisure and fitness cyclists come out to check out gear, while some just come to participate and see a good show. • Families with bikes outgrown can swap or sell to get the bike that fits, while at the same time enjoying a day full of activities. • There is something for everyone on every level, from the pro to the novice, to someone who wants to pick it back up. If you want a bike, want to sell a bike, want to learn about bikes, or just want to see what all the talk is about, we invite you to come share in this universal activity that crosses all borders and come together for a celebration of the bicycle. As a medium, carbon offers unlimited potential. Until Argonaut, you had to make a compromise: If you wanted the benefits of cutting-edge technology, you could go with one of the Big Three, “your” bike just one of hundreds marching down the same assembly line, “your” size just a letter on the tag of a T-shirt. If you wanted custom sizing, you could go with tube-to-tube or wrapped carbon, cobbled together without regard for the true benefits of the material. It’s impossible to make the best carbon fiber bicycle frame by cutting corners. So we don’t. You need proof? Let’s dispense with the formalities: Our engineering and production facility has been a leader in composite manufacturing for over 30 years. We have advanced molding and carbon tooling down to a science. A 4-axis CNC machine? Check. A 50-foot automated plotter? Check. We are engineers who know carbon just as well as we know the trails and twisting descents of our Pacific Northwest. We can make anything. Better. Lighter. Stronger. We choose to make your bike. Full disclosure: We geek out about torsional stiffness, and wax philosophical about fiber to resin ratios. We’re nerds like that. But words don’t win races. And jargon doesn’t make a 16% grade any less punishing. Imagine a carbon frame that takes all of what the Big Three has to offer and marries it with the relationship that only a custom builder can give you. That is Argonaut. Hand-tooled leather Top Tube bag. This bag is designed to fit almost any top tube size, it has adjustable straps with snaps for more security. Easy to snap on and off of your bike, easy to access while on your bike, and a thin design so that you don’t have to worry about it rubbing on your legs while riding. Perfect for those who don’t like riding with a backpack yet want to carry a few items. This bag is hand sewn, cut, and stained. Items are made to order. Made in our workshop in Los Angeles, Ca. 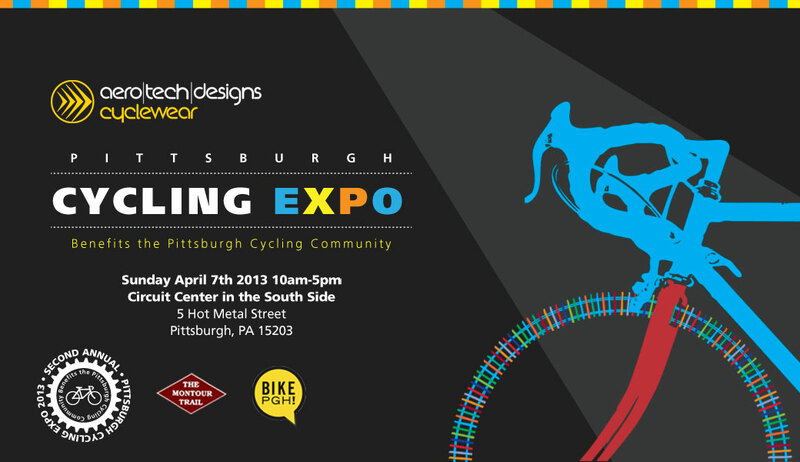 If you are interested in cycling and wish to learn more about cycling apparel and accessories as well as ride opportunities in Pittsburgh, you should plan to attend the Pittsburgh Cycling Expo being held Sunday, April 7, 2013 at the IBEW Circuit Center on the Southside of Pittsburgh. This first-of- its-kind event in the Pittsburgh area is open to bicycle enthusiasts, recreational bicyclists and anyone who has an interest in bicycling. Vendors and local bike shops are invited to display their wares in the Expo area. Trail updates and information on organized rides will be available. Doors to the Cycling Expo area will open at 10 am. The fashion show starts at 2 pm. Michael Bash, owner of Michaels Cycles in Natrona Heights, PA said when learning of the Pittsburgh Cycle Expo, "Pittsburgh needs an event of this sort." The Pittsburgh Cycling Expo is being sponsored by Aero Tech Designs in Coraopolis and manufacturing cycling clothing for more than 25 years. For more information relating to participating as a vendor and/or attending the fashion show luncheon please contact: steve@aerotechdesigns.com. Registration at: www.pghcyclingexpo.com. A cold winter with plenty of ice and snow hasn’t kept people from trying out the new bike infrastructure that was installed downtown this past fall. Ricksecker adds that new bike lockers, which were installed at only four locations to gauge interest, have not seen a lot of use so far but still could catch on when the weather warms come springtime. Every frame builder hopes to lay claim to the space between rider and bicycle, the balance between aesthetic beauty and stark practicality. It’s the goal: to contribute, to connect, to shepherd into being a tool that helps people live cycling. Cycles dʼAutremont aims to to build bikes that balance art with tool. This balance is what makes creative craft so compelling. A great frame has to fit, not just physically, but emotionally. It is the interpreter, translating the experience of pedaling into the ride. The subjective points of interpretation: angles and tubing choices, method and joinery, fork and wheels are the space where we love the work, the decisions, and the careful collaborative thought. Every bike is a chance to be better, to hit those choices just right with a client. Here, frames are built from a dialogue between client and builder. Here, frames celebrate the rider. That’s the process. It’s born of conversation and concepts. It’s finished when the frame is good. It’s finished when the frame is yours. But there's an opening in this bad news that you can ride a bike through. "All the bike traffic is part of the reason I chose the place, and I am definitely paying a premium for this spot," said Shana Lane-Block, whose 30-seat farm-to-table cafe and bakery Compote opened in 2011 on Portland's Clinton Street bike boulevard. "In the nice weather, it is astonishing to me how many bicycles go by." When Jon Kellogg started redeveloping vacant buildings along Portland's North Williams Avenue in the mid-2000s, he might have laughed at the idea that its six-foot-wide bike lane could be a meaningful river of revenue for his tenants. "I think there were 375 bikes a day on Williams," Kellogg said. "We saw some bikes there, and frankly didn't think twice about it." Then Portland's bike boom happened. Drawn to Williams by gentrifying neighborhoods and a long straight route in and out of downtown, the number of bike commuters on the corridor doubled once, twice, three times. By 2010, Kellogg's firm Adaptive Development Company was designing an entire retail development around businesses that would either serve bicyclists or draw on the appeal bikes brought to the area. One of SDOT’s most popular publications, the Seattle Bicycling Guide Map is now better than ever. The map presents information about cycling in Seattle in a clear, easy-to-use, and friendly format. The 2012 edition includes a fresh cover, an updated maps and graphics and descriptions about facilities including green bike lanes, bike boxes, and bike dots. You can download the map or order a paper copy free of charge using our online form. Seattle’s bike map is updated annually to reflect progress made in building the 450-mile bikeway network recommended in the Seattle Bicycle Master Plan. To receive a printed copy of this map, call Bike Alliance of Washington at (206) 224-9252, oruse the online form. You may prefer to plan your trip in advance by using our new interactiveonline bicycle map. It is developed to appeal to the various comfort levels of riders: frequent, average or occasional. Let us know what you think about the new maps. Write to us atwalkandbike@seattle.gov or call (206) 684-7583. NOTICE TO BICYCLISTS: This map and accompanying information is intended solely to assist bicyclists in selecting routes through the City of Seattle. In providing this information, the City does not assume liability for bicyclists who choose to travel upon any of the routes, trails or lanes shown on this map, nor does the City guarantee the stability, condition or fitness of any of the listed routes, trails or lanes for bicycling. Many of the routes, trails or lanes identified on this map cross and/or run on public roads that are exposed to daily wear and tear and degradation due to weather, motorized traffic and other environmental factors. As is true of any street, routes may contain pavement imperfections, including ruts, cracks, bumps, expansion joints, and debris.It is the responsibility of the individual rider to remain alert at all times as to the conditions of the road, pedestrian and other traffic on the road, and the inherent potential for conflict in any shared-use space. Route users should always ride with care for their own safety as well as the safety of all other users of the road or right-of-way. Coloring of bicycle infrastructure now corresponds roughly with the King County Bicycle Map that can be downloaded at the King County website. The hope is that this map style can become the base for a standardized map that jurisdictions throughout western Washington can employ when creating new bike maps. Commute Seattle is a not-for-profit transportation service organization working to provide alternatives to drive-alone commuter trips in an effort to improve access to and mobility through downtown Seattle. Their interactive bike map is a useful tool for finding bike parking within the Center City area. While the City of Seattle does not provide point-to-point route suggestions, Googleand Ride the City do. Enter your starting point and your destination and they will suggest a route for you. Note: These routes are not generated by the City of Seattle. Their accuracy has not been verified. Conditions may vary from those shown on the maps. Cyclists should use caution when exploring suggested routes. This questionnaire is the first step of a research project about recreational and competitive cyclists and cycling. All participants in the project have the chance to win one of our gift certificates worth $150. 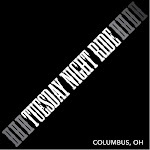 The gift certificates can be redeemed at www.ekoistore.com to order cycling clothing, helmets, eyewear, etc. Responding to the survey will take about 9 minutes. The objective of this research project is to better understand the lifestyle of cyclists of all levels and to explore how cyclists train in order to develop better training plans. Your information will only be used for statistical analysis and segmentation and will not be public or shared. If you wish to have additional information about this research project, please contact me by email. Thank you for participating in my research project. Please feel free to transfer my email invitation to other recreational or competitive cyclists you know. The Stupor Bowl didn’t always have the drinking component—that came in 2002, five years after the first race, when a bike messenger named Chad Selberg had the bright idea of putting the checkpoints at bars. From then on, being able to ride in a straight line after a dozen shots became as important as riding fast. This year, cyclists could either treat the event as a normal (albeit cold) 50-mile-long bike race that takes them all over the city, or they could embrace the true spirit of the event and down a shot of liquor or a beer at each of the nine checkpoints. Surprisingly, all of this is 100 percent legal, since it’s not a crime to ride a bike under the influence in Minnesota. And a spokesperson for the Minneapolis Police Department had never even heard of the Stupor Bowl when I asked whether there had been any incidents this year. That's probably because organizers like to keep the Stupor Bowl hush-hush and don’t publicize it widely; the race’s website doesn’t mention the drinking or when it takes place. See no drunken bike race, hear no drunken bike race, speak no drunken bike race. Or something.